#34 Squadron received its charter from the Air Cadet League of Canada on October 29, 1941. The main purpose for the formation of air cadet units during wartime was to provide a pool of trained men for the air force. 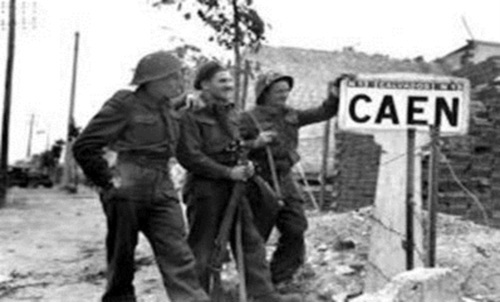 After the war, the cadet movement became Canada’s largest youth organization open to enrolment for boys between the ages of 13 to 19 years, focused on providing leadership, citizenship and skills training to young men from across the country. #34 Squadron paraded from Scott Collegiate High School in Regina until the end of the war. The squadron then moved over to the Regina Armoury, where it remains today. A short time after moving to the armoury, the squadron adopted the name “Sabre” after the RCAF’s F86 fighter aircraft. Enrolment and interest remained high throughout the 50’s and 60’s with as many as 150 young men on strength with the squadron at a time. Since the mid 70’s to present time, numbers have fluctuated from 40 to 120. In 1975, females were officially welcomed into the cadet organization. This act allowed the cadet movement to truly become an organization open to all youth in Canada. Finally, in the 1990’s, the Canadian Cadet Organizations lowered the minimum age to 12, making it a true seven-year program. #34 Squadron is supported by a very active Parent Sponsoring Committee, which raises funds for the squadron to cover the cost of trips and activities not funded by DND. 2008 saw the squadron take on a corporate sponsorship with the Regina Airport Authority. As the Regina International Airport is named Roland J. Groome Field after the World War I pilot and Canadian aviation history maker Roland J. Groome, the squadron saw it fitting to change its official name from #34 Sabre to #34 Roland J. Groome Squadron. This was done in order to honour our new sponsors and our local aviation history icon. Today the squadron maintains a full slate of CIC officers as well as a number of specialists and volunteers to aid with instruction. #34 Squadron is very active in all phases of cadet training including marksmanship, biathlon, music, and precision drill along with a host of other sports and recreational activities. #34 Squadron also participates in many community activities when called upon by local agencies for volunteer help. 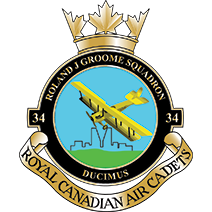 #34 Roland J. Groome Squadron has consistently been one of the top air cadet squadrons in the province throughout its history to present day. It is a legacy all of its members, from officers to cadets and sponsors will always strive to maintain. Lieutenant Roland J. Groome was an aviation pioneer who held several firsts in the field of Canadian aviation and brought Regina to national attention with his aeronautical achievements.Lieutenant Roland J. Groome was a flight instructor with the Royal Flying Corps during World War I. After the war ended, he returned to Regina with 2 wartime buddies, Edward Clarke and Bob McCombie. The men formed the Aerial Service Company in 1919 and laid out an airfield near the corner of what is now Hill Avenue and Cameron Street. This was the first licensed aerodrome in Canada.Groome become the first licensed commercial aviator in Canada and one of the company’s airplanes, a JN-4 (Can) Canuck, became the first licensed commercial aircraft in Canada (registration number: G-CAAA; this registration number can be seen on the aircraft on our new logo) Groome flew the first intercity airmail in Saskatchewan between Saskatoon and Regina. In 1927 Groome expanded his aviation business by founding Universal Air Industries with Jack Wright. 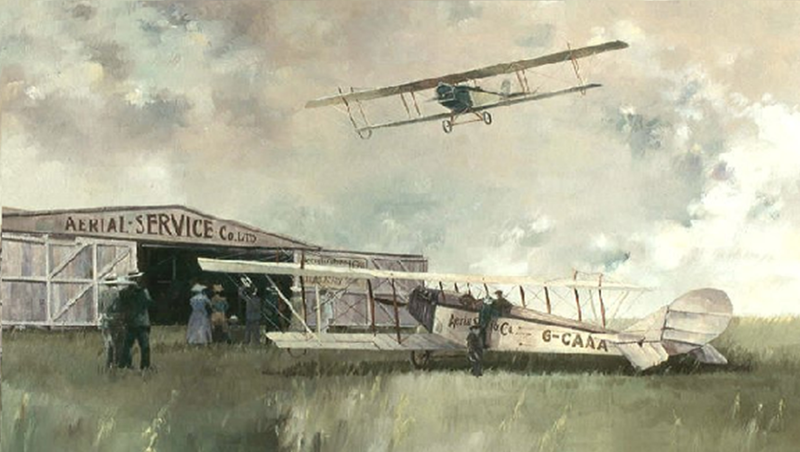 The two men built a second airfield, the Lakeview Aerodrome, on the site where the Golden Mile Shopping Centre now stands.Also in 1927, the Regina Flying Club was formed and some land west of the city was purchased by the group with the aim of creating a more modern airport for the city. By 1929, Groome’s Lakeview Aerodrome was closed and all aircraft moved to this new site. In 1930, the Regina Municipal Airport officially opened on the same site where the Regina Airport now stands.Groome’s business continued despite the grim economic times, but in 1935 tragedy struck. On September 20, 1935 Groome was on a training flight with a student when the plane they were flying in crashed at the Regina Airport. He did not survive, but his legacy did. While Air Cadets in Canada were actually started in British Columbia circa 1938 , the Air Cadet League of Canada was not chartered until April, 1941.The Air Cadet League of Canada along with the 12 Provincial and Territorial Committees have been providing direction, guidance and support to the Air Cadet movement in Canada for over 60 years.The Air Cadet Program is open to the youth of Canada who are between the ages of 12 and 18. Administered jointly by the Department of National Defence and the Air Cadet League of Canada, the program offers a wide variety of training and exciting challenges and rewards to those young people who have chosen to take part in this program.There are no fees or costs to join Air Cadets and uniforms are supplied free of charge. While the program is military based, there is no obligation for a cadet to join the Canadian Armed Forces when he or she finishes their cadet career.The Air Cadet League of Canada today is comprised of three levels throughout the country; the National Organization, the Provincial Committees, and the Squadron Sponsoring Committees. The Air Cadet League is a very large organization, which assists the Department of National Defence in administering Air Cadet training on all three levels throughout the country. The Air Cadet League provides a voice in Canada for the Air Cadet movement as a whole, so that the Canadian public is kept aware of the accomplishments and capabilities of the movement and of its ability to fulfill its aims. Cadets is a federally-sponsored program for young Canadians ages 12 to 18 who are interested in participating in a variety of challenging and rewarding activities, and learning more about the Canadian Forces. Cadets are encouraged to become active, responsible members of their communities. They learn valuable life and work skills like teamwork, leadership, and citizenship. Cadets also reap the personal benefits of increased self-confidence and physical fitness, learning how to take initiative, and how to make decisions. Cadets make valuable contributions to Canadian society on a daily basis in terms of environmental, citizenship and community activities. What does it cost to join? There are no registration fees, dues or cost for the uniforms or for the basic Cadet Program. Cadets and parents are encouraged to participate in fundraising. * Local training – Cadets participate in training on a weekly basis during the regular school year (Sept – June) on an average of one night a week, plus optional weekend training depending on their interests. * Summer training – There are a total of 24 cadet summer training centres (CSTC) located across Canada. Approximately 21 000 course cadets receive training and 2500 staff cadets are employed each summer in the 24 CSTCs and abroad on cultural and training exchanges.